One of the biggest projects we committed too practically fresh off the plane from Japan was painting all the trim, walls, and doors downstairs (upstairs will get done MAYBE before heading to Japan again come January). This was a crazy time demanding task but the payoff was more than worth it. We had the paint left over from our kitchen Cabinet re-do so it was like the entire thing cost nothing! I know that's not entirely true but for once we didn't feel like we were breaking the bank while updating our house! Frog tape really is better than blue painter's tape. It's all about the taping. If you are painting the walls you don't need to tape off above the trim. If you are able too, shimmy or scoot tape underneath trim. Nice brushes are expensive and expensive for a reason- worth it. Use a brush no wider than your trim. Less paint, more layers is better than more paint, less layers. A light sanding might help but we didn't and if I were to paint trim again I would go without sanding then too. Remove tape when paint is still wet OR use an exacto knife to alleviate pulling paint up with tape. Do not paint doors under a moving fan or by open widow- airflow causes the paint to dry quicker which leads to paint strokes. 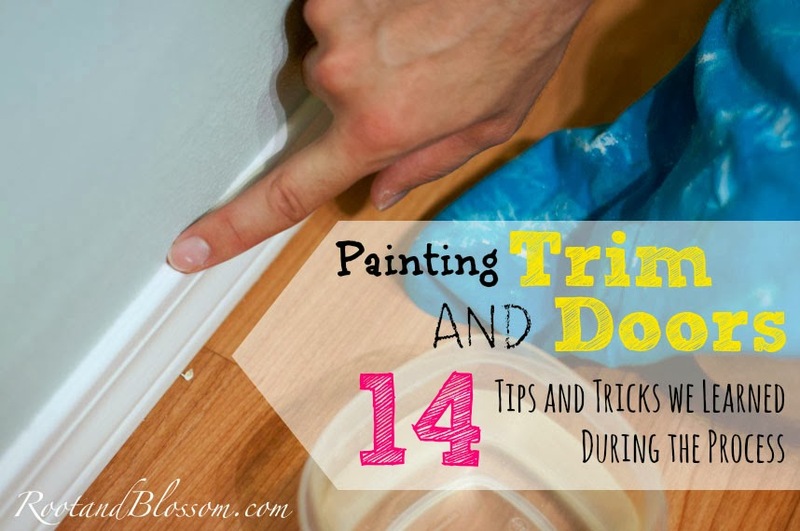 Give a gracious amount of time between painting both sides of the door if painting off hinges with door horizontal. Use a putty knife to press tape underneath carpet when taping off carpeted stairs. There is no easy way to tape of carpeted stairs. Make sure you paint below the height of the carpet. It is perfectly fine to caulk AFTER painting. There is no way to mess up too bad, unless you spill paint all over your carpet... That would be bad. Start with a small bead of caulking (cut a small hole). Run caulking on top of the molding as opposed to the wall. Keep a bowl of water next too you. Run a bead of caulking and smooth with a wet finger. a wet finger creates a smooth finish. keeps caulking from sticking to finger. We wound up needing to do three coats on the base trim and sills but four coats on the doorways and doors. It really was an incredible transformation, to us anyways. I hope to be sharing more of whats going on with house projects soon and some photos of what it actually looks like with the new trim! Love these tips because I'm about to repaint my main living areas. And some doors so that door tip was good to know too. Frog tape...I will have to investigate this, never heard of it. And what do you mean you don't have to put tape above the trim? I think I did that last time but if I don't have to, that would be amazing cause it takes forever. OH man this is perfect timing as I need to paint some of the trim in our house soon and I'm a little scared haha. Great advice, I will def be bookmarking this post for when I need it (hopefully soon). Can't wait to see some pictures! We so want to paint our baseboards, but it's such a feat - this is a great motivator. Awesome tips, Lena!